The Notre Dame Global Adaptation Index (ND-GAIN) at the University of Notre Dame is continuing to accept applications for the ND-GAIN Corporate Adaptation Prize, which recognizes projects that have made measurable contributions in creating resilience or adaptation to climate change, until July 31 (Friday). Projects must be led by either a multinational corporation or a local corporation working on a project in a lower income country and must include collaboration with local partners. Project applications will be judged on their measurable adaptation impact, scalability (relative within their category — multinational or local corporations) and market impact. Prize winners will also be consistent with the University of Notre Dame’s mission. The judges for this year’s prize include Dan Bena, PepsiCo; Nick Shufro, PricewaterhouseCoopers; Ryan Schuchard, Business for Social Responsibility; Aman Singh, Edelman; Lisa Manley, Edelman; Chris Walker, World Business Council for Sustainable Development; Peter Mulvaney, West Monroe Partners; Carolyn Woo, Catholic Relief Services; Charlie Hough, Novartis; Loren Labovitch, MWH Global; and Dethie S. Ndiaye, Centre Suive Ecologique. The winner(s) and honorable mentions will be announced at an awards event at Climate Week New York in September and to the national and international media. The simple six-question application can be submitted online. 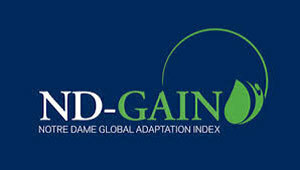 The Notre Dame Global Adaptation Index is a practical solution to the world’s climate problem. It promotes adaptation by identifying the places most vulnerable to extreme weather and changing climate and identifying real-world solutions that can prevent these changes from becoming disasters. Its flagship asset is the free and open-source Country Index, the world’s leading index showing which countries are prepared to handle global changes brought about by overcrowding, resource constraints and climate disruption. The index ranks countries based on their vulnerability and, uniquely, how ready they are to adapt. As people, governments and corporations are increasingly impacted by droughts, superstorms, civil conflicts and other disasters, ND-GAIN helps solve problems that keep leaders up at night by providing assets that transcend risks across sectors – including elements of water, health, food, infrastructure, security, governance, economy and society. ND-GAIN works with corporate and development leaders to manage risks made worse by climate change. Efforts include research, measurement and analysis, corporate engagement, and outreach. In addition to the Country Index, ND-GAIN leads an annual State of Corporate Adaptation Survey, to help further collective understanding of best practices, barriers, enablers and strategies to prepare for climate change in the corporate world; awards the ND-GAIN Corporate Adaptation Prize, a yearly prize that recognizes organizations that have made measurable contributions to creating adaptation to climate change; and create forums for influencers to discuss what is new in adaptation around the globe. ND-GAIN’s mission is to enhance the world’s understanding of the importance of adaptation and inform private and public investments in vulnerable communities. It is part of the Climate Change Adaptation Program of the University of Notre Dame’s Environmental Change Initiative (ND-ECI), a strategic research initiative focused on “science serving society,” and draw resources from across the campus. Originally published by Joyce Coffee at news.nd.edu on July 08, 2015.